Medium compact ornamental shrub with large orange-red flowers appearing in fall-winter. In its native habitat it grows in deep sand, sandy loam or sand over sandstone in shrub land & woodland, sometimes in semi-swampy places. It frequently extends to very exposed cliffs and bluffs near the ocean. It is a common plant among Hawkesbury Sandstone - Blue Mountains west of Sydney -where the average rainfall is usually 32-35" per year. Grown successfully in Ojai for the past 16 years relying on low rainfall and occasional heavy 17-20F frost. 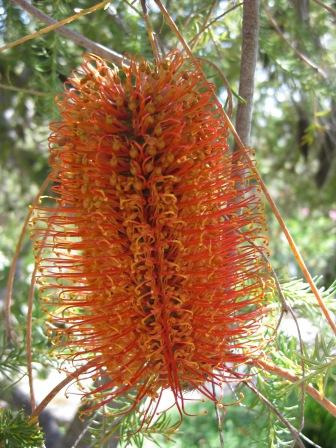 Grows well in shade or full sun positions. Attractive screen plant. Prune lightly, not below green foliage. 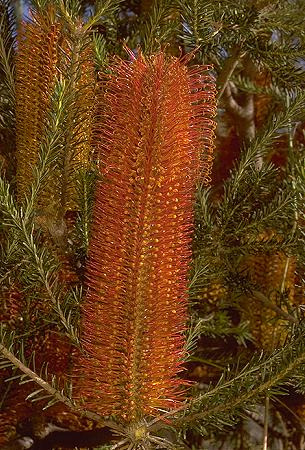 Banksia ericifolia is closely related to B. spinulosa and a cross B. 'Giant Candles' is often available. Germinates readily from seed. Several forms and varieties available. Wood turners have been known to use the wood for making bowls. Attractive hedge. Attracts Hummingbirds and Orioles.